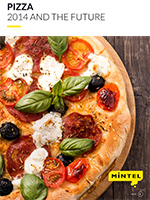 This global annual market overview will provide you with an in-depth review of the key issues in the global pizza market through 2014 as well as our forecast for what will happen in 2015 and beyond. Pizza is as versatile as it is indulgent. It continues to be enjoyed by consumers the world over, with the out-of-home pizza sector expanding its global reach through the likes of Pizza Hut and Domino’s, which, in turn, continue to influence innovation trends in the retail market. In the leading market of the US, retail pizza is struggling for growth. It’s a fairly unconvincing performance partly reflects the increased consumer confidence which has prompted consumers to trade up out of retail pizza and back to more expensive delivery and restaurant offerings. Consumer concerns about the healthfulness of pizza remain a barrier to eating pizza frequently, too. In less established markets in Asia, Africa and South America, retail pizza generally remains a budget-oriented offering with less of an emphasis on premium quality or authenticity, compared with Western markets. Meanwhile in the US and Europe, frozen and chilled pizzas have been eschewing the middle ground by striving to convey a more premium image by using artisanal production techniques and ingredients of authentic provenance and - conversely - delivering more economy-positioned lines.